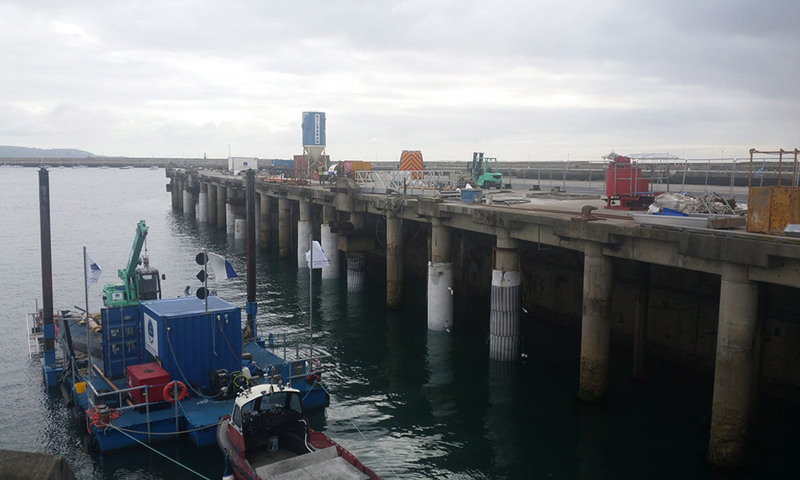 Dive and Marine Contractors acted as the specialist marine subcontractor for the Carlisle Pier Pile Remediation Contract. The project entailed the removal of 31nr. green-heart timber fender units (approx. 16.0 meters long) and placement of a 1530mm dia. Proserve formwork pile jacket around 24nr. existing damaged piles with a pumped grout mixture. Dive and Marine Contractors mobilised there work barge, workboat, mobile dive container and crawler crane to Carlisle Pier so that works could be carried out from the water. Dive and Marine Contractors used a high pressure 18,000 PSI jet washer system with an underwater diver operated retro-lance to remove all marine growth, loose concrete and any corrosion to the existing steel reinforcement. All staff were required to complete a safety awareness course and were certified during a training session in the safe use of high pressure jetting equipment under the certification of The Water Jetting Association. All 24nr. piles were excavated at the base to a depth of -1.0m below seabed level by our divers. A casement of new reinforcement was also attached to the pile on each damaged section by our team of divers. Our divers then placed the Proserve formwork pile jacket and corset around each pile with follow on pumping of a 50N fibre grout mixture. Dive and Marine Contractors completed the works successfully, safely, efficiently and on-time to the construction programme. Close liaising with harbour authorities, RNLI staff, Yacht clubs and the client representative was paramount for the success of the project. All Mobilisation and Demobilisation movements were conducted at a selected pier authorised by the Harbour Authority.